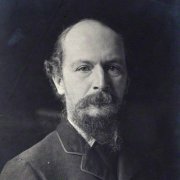 Algernon Charles Swinburne (1837-1909) was an English poet, playwright, novelist, and critic. He wrote several novels and contributed to the Encyclopædia Britannica. He grew up at East Dene in the village of Bonchurch near Ventnor. The house was leased in1836 to his father, Captain (later Admiral) Charles Swinburne, who bought the property in 1841. Algernon was educated at Eton and then Balliol College, Oxford, where he first started writing poetry. At Oxford Swinburne met several of the Pre-Raphaelite artists, including Dante Gabriel Rossetti, and William Morris. After leaving college he lived in London and started an active writing career, where Rossetti was delighted with his 'little Northumbrian friend', probably a reference to Swinburne's diminutive height - he was just five foot four. In 1863 Algernon returned to live briefly at East Dene. He is buried in the churchyard of St Boniface (new church) in Bonchurch.